Salem Emergency Physicians Service, P.C. Salem Emergency Physicians are committed to providing the highest quality care in a safe, compassionate and efficient manner for patients, their families and our community. Salem Emergency Physicians Service exists so that our patients experience high quality emergency care while our physicians enjoy an exceptional career. Welcome To Salem Emergency Physicians Service, P.C. 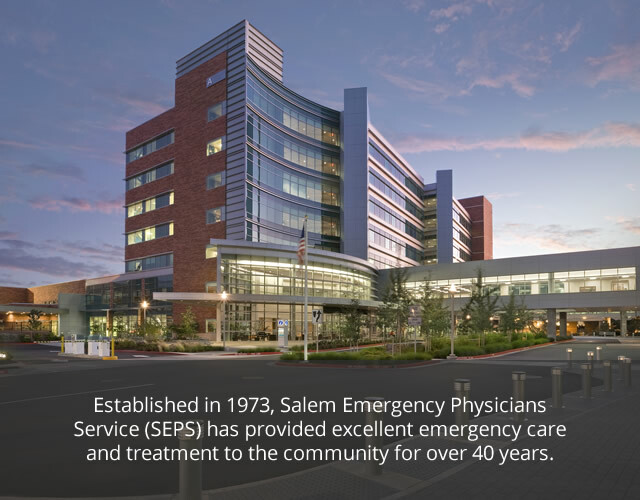 Established in 1973, Salem Emergency Physicians Service (SEPS) has provided excellent emergency medical treatment to the community for over 40 years. SEPS is a group of employed physicians, contracted physicians and advance practice providers practicing Emergency Medicine. SEPS is a democratic partnership solely owned by affiliated independent physician practices. SEPS enjoys an excellent retention rate by implementing practices which prompt long and fulfilling careers. SEPS has built an impeccable reputation for excellence, patient satisfaction and a strong hospital relationship. SEPS has the leadership, experience, professionalism and culture of team work to ensure continued success. Although several SEPS physicians are NW natives, we attract a diverse group of physicians from top programs around the country who now call Salem home. We love to live where we work and play! Geography: Oregon’s capital, Salem is centrally located in the world famous wine country of the Willamette Valley. A one hour drive from the Pacific Coast, the Cascade Mountains and Portland, outdoor recreation opportunities are world class! Climate: Mild with long dry summer and fall seasons, and moist winters with very little snowfall. The Willamette Valley enjoys one of the longest growing seasons in the country. Amenities: Salem is the second largest city in Oregon and has urban amenities without the traffic and overpriced real estate. Willamette University, the first in the West, is located in Salem. Schools: Salem public high schools compete at the 6A level, the highest in the state for sports and music. Three out of six Salem high schools have won Grammy Awards in music, some multiple times. Salem schools consistently outperform other Oregon school districts in SAT scores. Mission: Salem Emergency Physicians Service is committed to providing the highest quality care in a safe, compassionate and efficient manner for patients, their families and our community. Salem Emergency Physicians Service hires providers as needed to accommodate patient volume, which has steadily increased annually. Located in the heart of the Willamette Valley, Salem offers a multitude of attractions desirable to people who enjoy outdoor sports, craft beer and wine, local art and culture, and great food. There is an extensive network of parks connected by pedestrian /bike only bridges on both side of the Willamette River. 890 Oak Street, SE, Building "A"